I just spent a week discovering the coastline of Ireland with a good friend. It was an unexpected detour in my trips, and one I'm glad I made. Ireland has always been a place I've wanted to visit but never a place that made it very high on my list of actual stopovers. Italian sunshine, English produce, French wines always seem to beat it out. Besides you run the risk of spending a week of vacation under a heavy, rainy Irish sky. Not the best way to relax. Well, I made it, and here is the first post on our adventures. I should start by saying that we hit the global warming weather phenomenon of an amazingly spectacular week of sunshine. We saw the famous Irish fog once, and almost optionally since we could have turned right back into brilliant sunshine. Everyone we met, and we met a lot of people because the Irish are very friendly and flirty, was as stunned by the streak of cloudless, sunny, and hot days we were blessed with during our time. I had been to Ireland once before as a very young college student. I'd seen Dublin, and had caught a tiny glimpse of the gorgeous countryside when I ventured south to stay in a B&B for a night. (This was also my very first solo traveling trip ever, twelve years ago. I did that math and ouch.) I knew from that trip that on a sunny day the Irish country side had the potential to be sublime, so we focused our planning on seeing as much of it as we could in a week and crossing our fingers. We booked and packed for rain, crossing our fingers for a bit of warmth, and have ended up wearing the same one light summery thing because its all we brought for 28C heat. 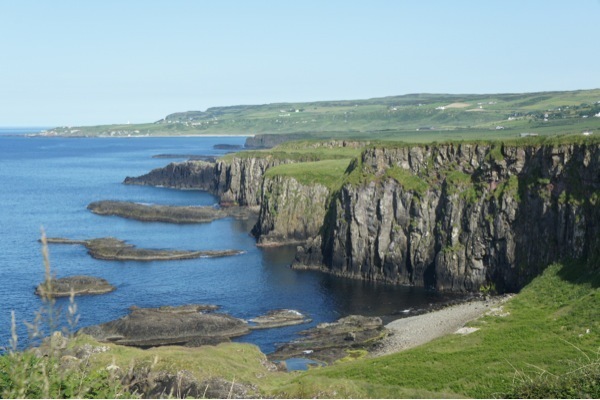 Despite a rough arrival - I pulled into our B&B at 2 am and Harpreet at 6 am due to the accident at SFO - we headed off as early as we could go to Northern Ireland (around 11 am after eating our weight in soda bread and scones at the Sandy Hills B&B) and see the Giant's Causeway. This is one of the top sights to see on the island, and though I hadn't thought about it much, it should have been packed with tourists. Turns out we decided to go up about a week before the rather controversial annual march by the Orange Order. It is one of these events that reminds everyone of Ireland's painful past and present conflicts, and as seen this year, in sporadic violent episodes. However, as a tourist, its brilliant. The March meant that tourists and locals alike were staying well away from Northern Ireland for at least a week, and we basically had the Giant's Causeway to ourselves. We stopped for a bit to eat at the lovely, if a bit pricey, Bushmill's Inn in the town of Bushmills and I had a seafood platter delicious enough to make a Frenchman cry. Seriously. I think my father (said Frenchman) might have been in shock at how good it was. Espresso in Cornwall and 'fruits de mer' in Ireland - maybe the world is a better place? I digress and distract from the main point. After lunch we headed up to the Causeway with a goal in mind: to hike the whole thing. As we would later figure out, we had a mini blessing in disguise, in that we had to abort that plan and could only walk half of it. I think the whole thing, or at least the main part, which runs from Carrick-a-Rede (or the Rope Bridge) to the actual Giant's Causeway is about 16 miles. We parked our car in a tiny little fishing harbor and walked 6 miles or so back towards the Giant's Causeway. We essentially had the coast all to ourselves, with a perfect sunny day bleeding into a long late Northern European afternoon (sunset at 10:30 pm). The coast line on the Causeway is majestic, ancient, and truly one of the most beautiful sights I've seen on this trip. The setting sun (we didn't finish till 8 pm), the fluffy sheep dotting the landscape, the deep blue and green Atlantic, all of it only served to make the strange rock formations and talk cliffs of the Causeway Coast seem even more otherworldly. 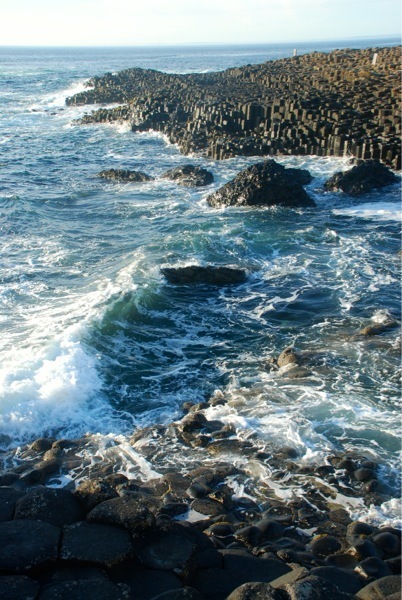 The star of the Causeway Coast is the Giant's Causeway, a strange formation of basalt stone shaped into heptagonal pillars. The pillars line the cliffs for miles, but only at one spot do they extend into a low lying small spit into the crashing Atlantic. At this spot, they are human sized and you can walk all over them. I must have seen a million pictures of these neat rock formations in a thousand national geographic magazine spreads, but it really is special, and much more so in person. Go! (I think I should have a 'Must Go' section on this blog - the list is getting long). We wrapped up our walk by flirting our way into the closing visitor center for a quick bite and a souvenir mug. We had about an hour walk back to the car along the road skirting the coast, before our three hour drive home to our adorable B&B in the town of Rush, north of Dublin (Sandy Hills B&B). Luckily for us, an adorable young woman from the visitor center picked us up about 10 minutes in and saved us from the hike back. We made it back to the car, in awe of the coastline and the friendliness of the people. A long drive took us home. And we went to bed at 2 am, with plans to drive to Galway the next day. Below some pics from our Northern Irish interlude.